For the second day of cooking my family recipes, is this Bittergourd Pakoda that are quite famous in the sweet shops as well. I am a person who will run a mile if served some bittergourd and even if its done in these tempting way, I never tried before. For many years, when we travel during our vacation, Amma always used to make Masala Peanuts, Murukkus and other savories. Later it slowly shifted to store bought snacks for the ease and time saved. So it was always Adyar Ananda Bhavan for us, which is close by. While one can’t carry onion pakoda par se for vacation, as it has shorter shelf life, these bittergourd pakodas on the other hand would stay for couple of days. Even then one can’t tempt me. Of course its a different issue that Hubby dear is quite fond of this vegetable and won’t mind a masala made out of it. And many a time these bittergourd would find its way as these pakodas too. On one such occasion, when it was a dal, Amma said these pakodas would go well. It struck me that I never clicked the pictures of these pakodas as I don’t eat. But then, this space a record of all that gets cooked and devoured by all at home. Why I thought I should only do justice to it and record it. Wash and slice the bittergourd. Take the slices in a bowl and add 1/2 tsp salt. Let it rest for 30 mins. Squeeze out water from this and transfer to a bowl. Add the flours, spice powders and salt. Mix well to coat all over. Heat oil for deep frying and fry in batches. Transfer to a serving bowl, add fried curry leaves and toss together. Water is not added, you can sprinkle few drops to make the bitter gourd coated with flour. These are so delicious , i have never made these and have always bought from Hot Chips , but what a simple way to make ! Will definitely try soon . I love bitter gourd in any avatar. 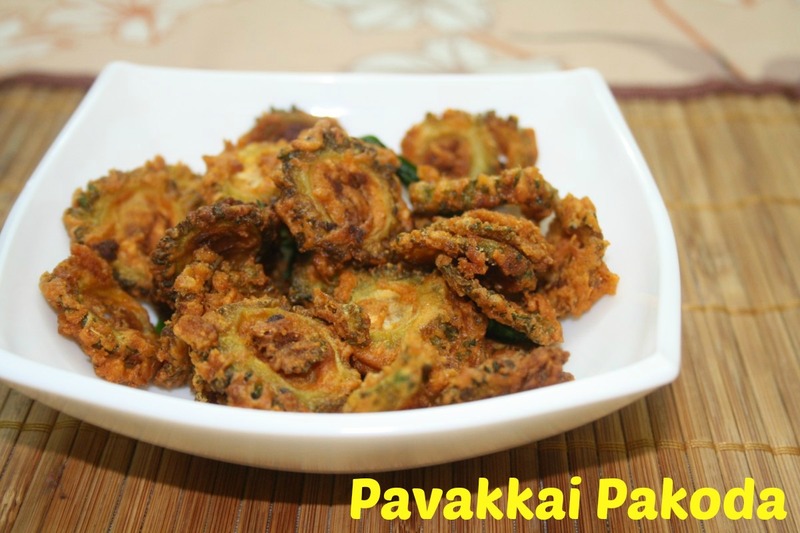 This looks perfect with a cup of coffee..
not a great fan of pavakka but this sounds really tempting !! 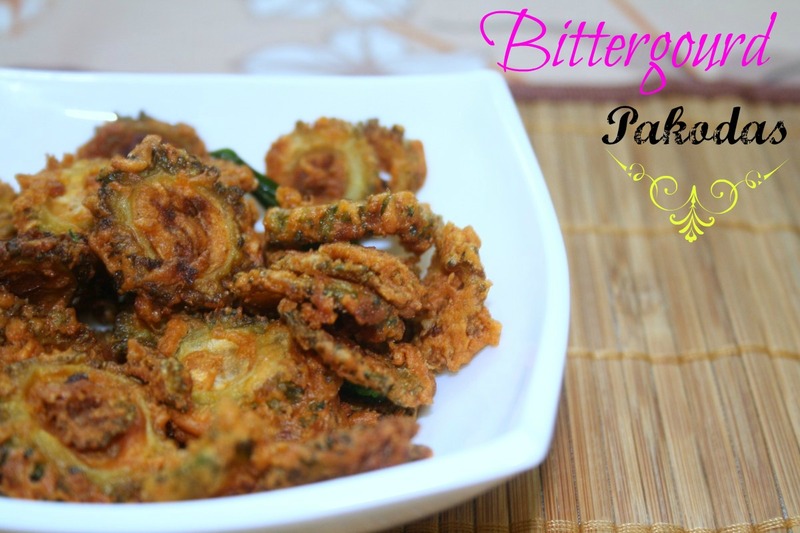 I love bittergourd and will surely try these pakoras.Looks tasty. Such a tempting and crispy bitter gourd chips. Not like bittergourd but this pakoda is exceptional,looks crispy and addictive.. I too am not a fan of this gourd but recently started to love the microwave version of it.